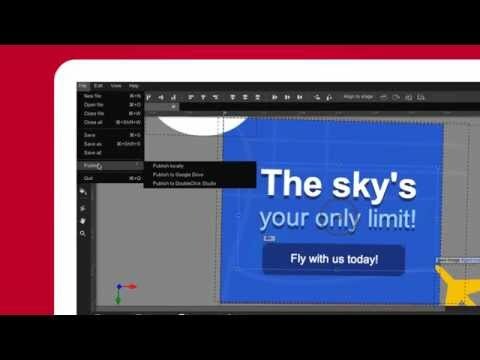 Google Web Designer offers a free suite of features to create interactive, responsive and animated ad creatives. The tool can be used to create ads and banners that work on all mobile and desktop devices. You can add in various components to your ads such as iFrames, maps, image galleries, YouTube videos and tap area features. You can customize your content to react to actions such as shaking and rotating on mobile devices. With Google Web Designer you can build creatives for content through the Quick mode or Advanced mode. You can create animations and 3D content easily in either mode. You can also edit your own designs using the various content creation tools such as the Pen and Shape tools. All files and ad content can be shared through the native integration with Google Drive and published through the integration with DoubleClick Studio and AdMob. With Google Web Designer you can create great websites. Its easy to use, user friendly and the most important, its fore free. Great tool for people which want to make beautiful webistes. Thanks to Google Web Designer you can create great websites. Addictionally you can make webistes very quickly and for free! If you want to make something beautiful you shouls have primary knowledge about createing websites. Pre-programmed web components: Default components include iFrame, maps, tap area, image gallery and YouTube videos. Events: Sync actions with events such as content that reacts to touch, tilt, rotation and shaking. Pages: Add multiple pages to your content that your audience can navigate among as they wish. Animations and 3D: Create animations by connecting scenes or using layers on a timeline. visualize 3D transformations by rotating objects and 2D designs along an axis. Custom Design: Create you own custom designs using the Shape, Pen and Tag tools, as well as the Gradient Editing tool. Below are some frequently asked questions for Google Web Designer. Q. What type of pricing plans does Google Web Designer offer? Q. Who are the typical users of Google Web Designer? Q. What languages does Google Web Designer support? Q. Does Google Web Designer support mobile devices? Q. Does Google Web Designer offer an API? No, Google Web Designer does not have an API available. Q. What other apps does Google Web Designer integrate with? Q. What level of support does Google Web Designer offer? Q. Which apps is Google Web Designer compared to most often?